Passion can strike at any time, anywhere. How clever of you to be prepared. Kama Sutra Weekender Kit KS0007 - A perfect introduction to the many joys of the Kama Sutra line, this sampler box slips discreetly into a purse, pocket or overnight bag, letting you steal away to a sensuous world. 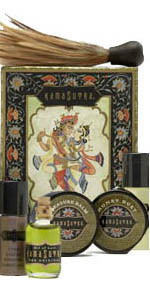 With the Kama Sutra Weekender Kit take along sampler, romance will never catch you unprepared. A weekend away should always come complete with a few romantic get-away ideas, including travel-size portions of The Original Oil of Love, Love Liquid Lubricant, passion-sustaining Pleasure Balm, silky Sweet Almond Massage Oil, and edible Honey Dust with a feather applicator. Sure fire favorites for those experienced in the joys of Kama Sutra, or a perfect introduction for anyone in the mood for new adventures. Condom safe, Dermatologist tested, hypoallergenic. Kama Sutra Weekender Kit Contains: Kama Sutra Original Oil of Love, .25 oz., Kama Sutra Pleasure Balm .125 oz., Love Liquid Lubricant .25oz, Sweet Almond Massage Oil .25oz and Kama Sutra Honey Dust 9 grams.